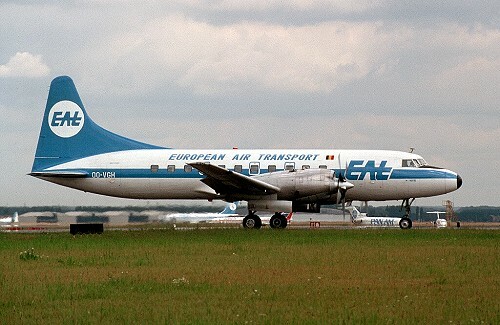 History: European Air Transport (EAT) was formed on December 9 1971 by P. Pirlot de Corbion & C. Dessain. Initially they provided from April 1972 onwards air-taxi services and flying school activities. During 1973 they became a "Piper Flite-Centre" for Belgium. After winning a contract with SABENA to operate short haul services with pressurized turboprops, they bought in March 1976 a Swearingen Metro and began one month later operating commuter services to Eindhoven, and this airframe OO-JPI was painted in full Sabena colors. Later on, the network was extended to Dusseldorf, Cologne and Luxembourg, and more Metro's/Merlin's were added. In 1978 they became also dealer for Mooney aircraft for the entire Benelux. Between 1980-1984 Metro/Merlin capacity was leased to British Caledonian on their Gatwick-Brussels route. On July 29 1985 they started nightly parcel schedules to Basle on behalf of DHL with two converted Metro's. During 1986 this evolved into a major contract with the (at that time) American courier for operating parcel services within Europe from main hub Brussels. In fact the Belgian company became 100% owned by the DHL group. More Metro's/Merlin's were added + one Casa 212 but soon all these airframes became to small and a dozen Convair 580 were bought, later upgraded to B727-100, B727-200 and A300. For a couple of years extra capacity was used in the form of B727s of Air Contactors and Express One. In the new millennium the noisy B727s were replaced by B757s. Besides their own fleet, some of the parcel flights within Europe are operated by foreign carriers like Air Atlanta Icelandic (B737), Atlantic Airlines (Electra, ATR42, An72 and ATP) and Swiftair (ATR42). The long haul sectors to Dayton, New York and Lagos are carried out by leasing DC10/MD11 capacity from World Airways, Gemini Air Cargo and DAS Air Cargo. EAT also uses belly capacity on some of the scheduled pax carriers at Brussels. Besides the regular parcel flights, the company also undertakes cargo (charter) flights, sometimes on behalf of third parties like Royal Air Maroc. On March 29-30 2008, DHL moved its main operational hub to Leipzig, Brussels remains as regional hub. In January 2010, DHL decided not to prolong EAT's AoC from March 31 2010 onwards. This means that by than all their aircraft will be transferred to foreign carriers like Air Contractors and European Air Transport Leipzig to fulfill the parcel duties. By March 26 2010 indeed all EAT's aircraft left the fleet ending a 34 years story of flying status with own material. But EAT will not cease entirely as (these) foreign aircraft can always be required on demand.